Robyn has been rehabbing houses and speaking to real estate investors around the country for over a decade now. Some like to think these out of town speakers are all about sales. Some in fact are. But let me tell you my experience. My wife Terron and I heard Robyn speak at MIG way back when we were just getting started in 2004. We were impressed. We bought her course materials and Terron flew up to Connecticut to attend Robyn’s bootcamp. As proof, here is a picture of the materials we purchased. You can tell its age because it is comprised of VHS tapes and even better, cassette tapes. I’m not even sure I can even watch and listen to it now. Looking back over the course materials today, I see that the manuals are full of sticky tabs, highlights and notes that we took when we were figuring out how to get started. We were learning all we could about real estate back then. And after hearing Robyn speak at MIG, we decided to make an investment in ourselves and our business by purchasing the course and bootcamp. Were these materials a bit pricey? Yes. But, was it worth our investment? Absolutely it was. Here are five reasons why. 1. Robyn’s Course Provided a System. Your real estate activities are a business and systems are what make a business successful. Could you develop your own systems? Sure. Should you develop your own systems? Yes. But you have to have someplace to start and there is absolutely no need to reinvent the wheel. 2. Robyn’s Course Increased Our Productivity. Could we have developed our own systems and way of doing things? Sure. Have we over the years? Yes. But with our newly acquired knowledge and systems from Robyn we were able to hit the ground running. The checklists she provided were key. 3. Robyn’s Course Saved Us Money. It increased our productivity. Time is money they say. Robyn’s course taught us how to speed up our rehab process, which saved us time and thus saved us money. 4. Robyn’s Course Made Us Wiser. One of our biggest fears as newbies was dealing with contractors. Robyn explained many of the tricks of the contractor trade. She had “been there done that” many times before. We applied what we learned and benefited greatly from her experience. 5. Robyn’s Course Made Us Money. This is what it is all about right? Robyn’s course helped us achieve success. Earlier, I called Robyn’s course an investment. That is exactly what it is. It is an investment in yourself, in your business and in your future. 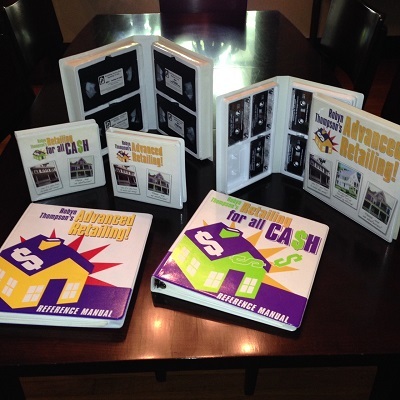 Courses like Robyn’s will save you time, save you money, make you smarter and best of all make you money! So, should you come to MIG to listen to Robyn on Thursday? Yes! Will Robyn have some great information to share? Yes! Will Robyn have a course to sell? Yes! Will it all be worth it? Yes! Kevin Perk is co-founder of Kevron Properties, LLC with his wife Terron and has been involved in real estate investing for 10 years. Kevin invests in and manages rental properties in Memphis and is the past president and vice-president of the Memphis Investors Group. Follow him on his blog Smarterlandlording.com.